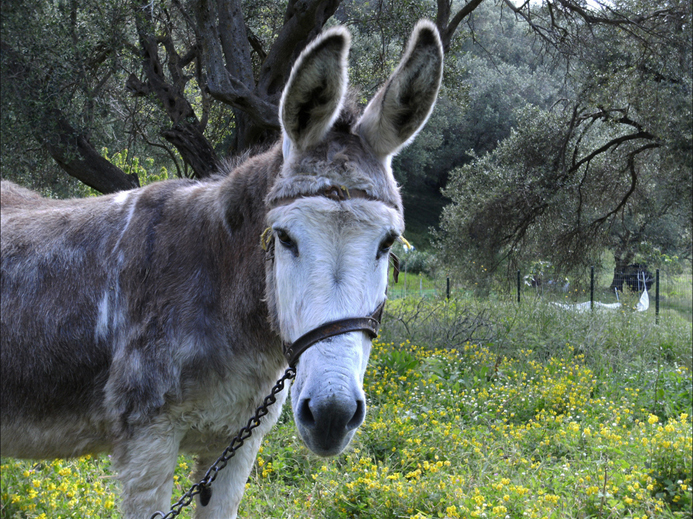 Afionas – The colouful Village of Corfu ! 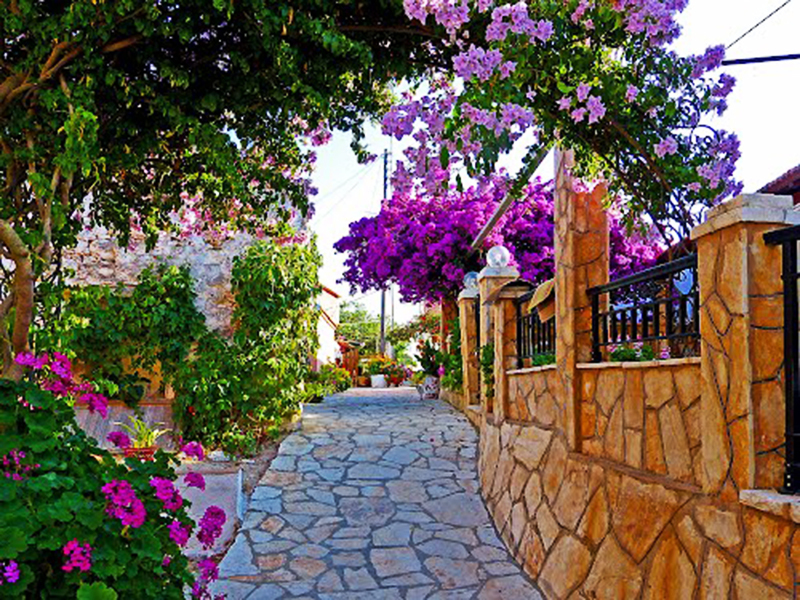 May and June are the months when Afionas – the ‘flower Village’ – is at the peak of its beauty! 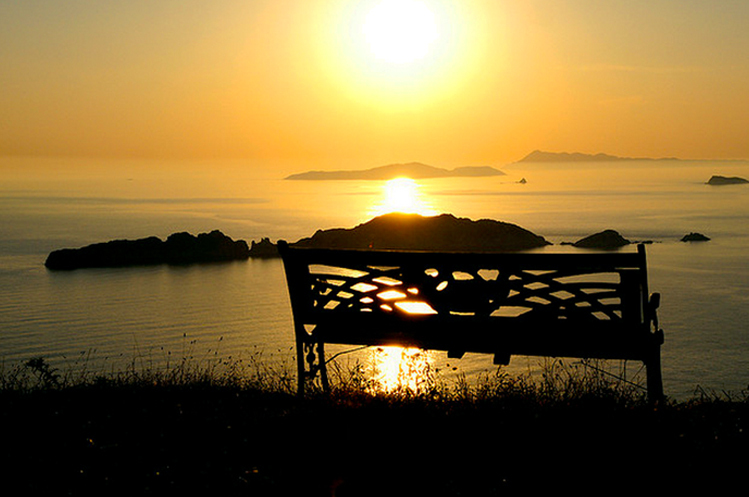 On the northwest Corfu lays for many centuries the small and picturesque village of Afionas. 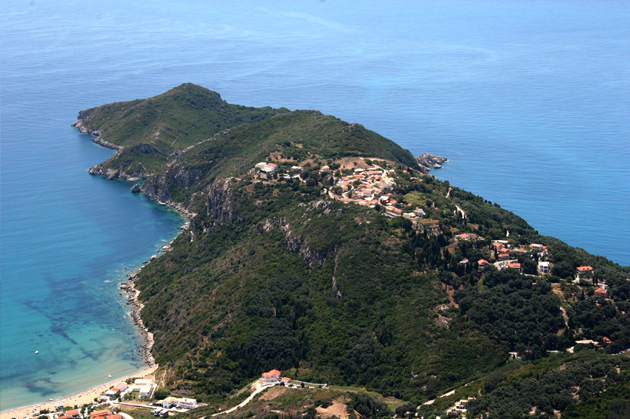 33 kilometers is the distance from the city of Corfu. 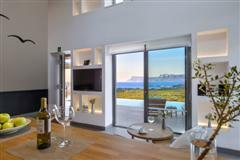 It is found in the nape of small peninsula that separates Saint Georges Bay and Arillas Bay. An all around green peninsula that gives you a sense of freedom while someone walks around the village because of the open seas that lays in front you, enjoying at the same time the splendid view on both sides. Looking on the N.W.we can admire the diapontia islands (Mathraki, Othonoi, Ereikousa) as well as a lot of other rocky islands and smaller uninhabited islets that as we'll see later hide a small dose of mythology and perhaps history. A lot is said and written for the origin of this small community sometimes encompassing in this moments of glamour. Anyway it is sure that world fame persons during the past are occupied and dedicated hours in this. 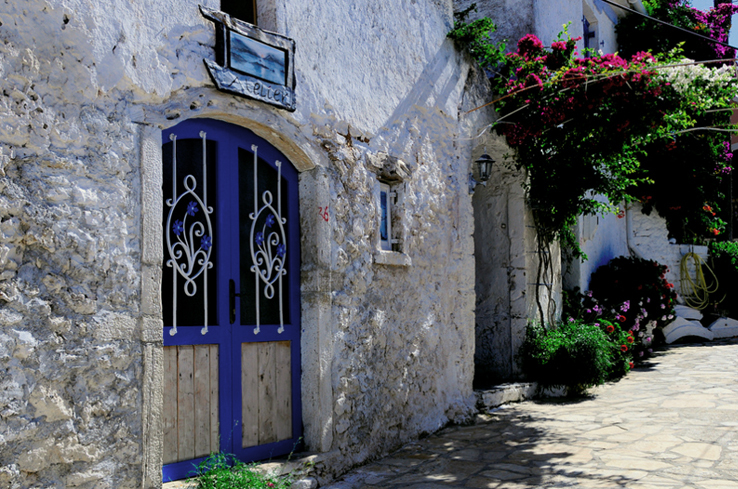 As we know for a lot of years the name of the village is Afionas. There are many versions for the origin of the name and looking at recordings of 16th century we discover that the most likely theory is that it belonged in the wider region of Kavadades called upper arillas (Arilas took its name from the trees named Arias - Querqus which exist up to today in the region). This can be concluded from notarial documents of the period 1503-1577 when we do not find community with the name Afionas in the wider region but only Kavadades which includes regions Upper and Lower Arilla. From this point and further, all elements converge that the period of first resident appearance in the village is round 1636 a.c. as it is proved from the year of manufacture of church of village Ag.Ioannis.In recording of surnames of period of 17th century (1675) it is found only the surnames Bardis and Ginis. So we can once again suppose that they are the older families in the village. This also appears in work of Professor Dimitrios Kapadohou - Temples and monasteries of Corfu the 18th century (1754.) where the temple of Ag.Ioannis is reported as belonging of these families and no other surnames are reported. Until today the most common surname is Bardis and this is not accidental. The season when the church was built (1636) is a period of permanent locomotion of populations from other Venetian colonies (as Corfu) to Corfu because those regions were occupied by the Turk's or because of the raids taking place on the island. The Venetians needed to supplement population in Corfu so that they maintain it alive and productive. They also knew that they should maintain the monopoly of olive oil for which needed many working hands. Therefore this happened also in Afionas where the residents of village Bardi (current Amygdalitsa) mountainous region in Argolida. , province of Nauplium moved in this point, acquiring as surname the name of their community of origin. If we really want to see the realistic side of the current name of the village emanates from the vineyard kind amfioni which was included in the Atlas of varieties of vine that published by the Ministry of Agricultural with more than 559 varieties and is reported to be cultivated in Corfu. Of course this is a rather realistic approach of origin of the name. Exist also other versions as that Ivi (acharavi took its name from her ungrateful (aharisti) - ivi acharavi) had a brother named Amfiona who the name Afionas was given from. Also an other version wants the village named Afionas from the geographic place. From the nape on where is built on. The conclusions are left to anyone well-disposed reader of this small work. Up to now however we dealt with more modern history of this very beautiful village. It is not however possible so much dowered place to be deprived from history and prehistory. Very little ruins of low wall reveal that the Venetians except the natural strengthened place of space attended they protected the region building parametrically wall. The existence of this stipulate region-names of region as Ambush, Vigla, Castle, Porto, Mouragia. Now is time to travel deeper in history. The small islands gave the opportunity Afionas to be connected with the wider region of N.W. Corfu with the History or if you want mythology with the famous palace of King Alkinoos ,the Hostage of Odyssey. 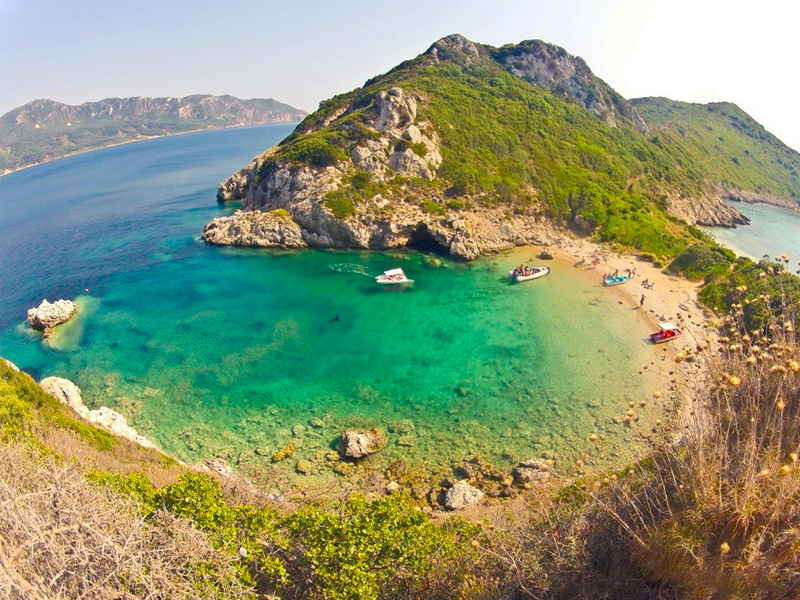 Opposite Afionas is distinguished a small rock in distance of few miles away the coasts, with the name boat. This appears to be the stoned boat of Odysseus. It can only be a legend of course. A fable that adds not only today glamour in the region. This type of legends and rumors gave reason in a lot of occasionally famous visitors of island in other times to write in their books reports or make even excavations. In the first case, was published in 1892 in 1892 one of geographic book of Parts professor of geography in the university Vreslandias as it is reported on the cover of his book. Josef Parts therefore except of the description of the geographic side was also first that reported this period for the mythological glamour of region reporting in the book of the legend Stoned boat of Odysseus from Poseidon. Also is reported one more mythological version of the name Afionas unknown in many up to now. It is written that existed on this very corner of island a bright city with the name Pamflagona. The king of this city was the brother of King of Corfu. Here exists also a variant of fable of boat at some way Christianized. The spouse and King of Pamflagona left to fight a foreigner state but at the duration of war he fell in love the queen of enemies and he abandoned her, leaving with his lover. Returning with her boat to her place the Queen of Pamflagona seeing the boat of the unfaithful husband requested St. Nikolaos to punish the unfaithful king so that it does not turn behind. Thus St. Nikolaos while the fable wants stoned the boat giving one more beautiful history, fable in the rich history of Afionas. All this history however does not stop here but is continued adding more glamour. On the row now is the Emperor of Germany Kaizer Goylielmos II. Dorpfeld session and friend of Kaizer studied architecture and no archaeology hence can say that it did not possess archaeological or philological training. When he finished his study he undertook an empty place of assistant of architect in the German archaeological excavations of Schliedman in Olympia . There they were met. Needing a mechanic architect in the excavations in Troia as well as in Tyrintha he takes him as an assistant. In 1890 Schliemann dies but Dorpfeld already in 1887 after help of Schliemann had become Director of German Archaeological Institute in Athens. In 1905 during a travel in Greece Kaizer visits Corfu and visits the empty then palace Achilleon. Remains stainless from the beauty of palace and after two years he buys it (1907). It visits it regularly and little before the beginning of first world war it takes authorization from the King George of Greece to make excavations in the place of Mon-Repos and elsewhere in the island. Already from the previous years we have said that existed rumors fames that the mythological city of King Alkinoos was somewhere else in the island and not in Mon-Repos. For this reason they begin with Dorpfeld excavations based on report of Hostage, connecting region-names and descriptions in all region N.W. Corfu and in Afionas. These excavations unfortunately did not bring in the light covetable results. The examination of soil as the surface excavations gave only certain tools and one-colored shells perhaps of prehistoric season and season of copper (3000 B.C.) Dorpfeld however did not hesitate to write in the official archaeological magazine Archeologischer Anzeiger in 1913 and 1914 that his discoveries correspond in relic one of prehistoric district wanting thus it connects the fable with the reality. All this we can understand is simply a desperate effort of Dorpfeld to acquire once again glamour, more fame and to appear equal his mentor Schliemann that discovered Troia. Sure it is that this very beautiful point of Corfu acquaintance henceforth more and more in local and foreigner visitors, maintains memories and moments beautiful in all those who visit it, constitutes pole of attraction for a lot of persons and this because it remains as possible can be unwaged from tendencies of excessive tourist layout maintaining its traditional form of graphic village Of Corfu. This version of History is recorded by the team of Cultural Association of Afionas.